Originally built as a grain mill around 1740 with a farmhouse added in 1862 The Mill Forge was known as Grahamshill farm and served the local estate. The next on their agenda was the conversion of the grain mill into a restaurant and bar which they opened in 1993. An increasing demand for wedding accommodation in the area saw them open a further 15 chalets style bedrooms in 1996. Their next efforts saw the completion of the Conservatory Bar in 1997 as more and more couples chose The Mill Forge as the place to stay for their Gretna Green wedding. Two years later they added 3 more chalets and a unique wedding ceremony venue in the ground of the hotel. The first civil ceremony to be held in Scotland took place in The Mill Forge. Throughout this time, the gardens and grounds were being continually developed along with a regular maintainance program to ensure the high standards expected of a wedding venue. 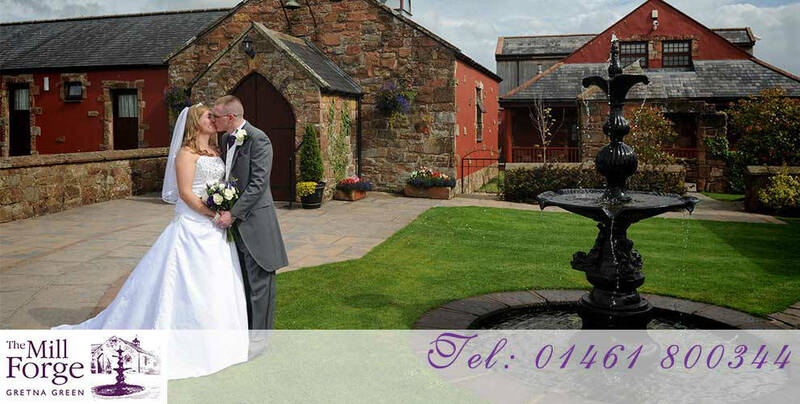 Become part of our history and have your wedding at The Mill Forge. Our wedding planners are happy to help.